These three simple steps are the hidden SECRET to master your emotions. How to stop suffering and self-sabotaging yourself with negativity. You can start creating the life you want, no matter where you are now. You still have power in yourself to make the changes you want. Its not your fault because we were never taught how to control emotions. Most of those around us don’t know how to control theirs either. I have never came across somebody who has put it so perfectly. As I was listening to Dr.Wyatt Woodsmall and Eben Pagan’s training program, “Leadership: You, Me & We”, Dr. Woodsmall put it so eloquently. Negative emotion drains energy. Positive emotion gives energy. In order to get rid of negative emotions, you first must know where it is coming from. As Wyatt explains it, negative and positive emotions both came from the same place. It’s up to us to CHOOSE how we want to be. Step 1: Change the pictures we create in our head. It is apparent we must diligently keep guard at the gates of our mind to only let the things we want in. Perception plays a huge role in what kinds of emotion we’ll experience. It triggers our body to tense up or to relax and act accordingly to the images we perceived and create in our minds. Watch your mind throughout the day. What kind of images are you catching yourself making? Are they scary images, fear images, images of scarcity and lack? Want to end these negative emotions? How? The answer is… stop creating the pictures that feed negative emotion. And if you want to be happy, create and focus on happy pictures. Flood your mind with images of what you want to create positive emotion. Control the pictures you create. Know you have a choice to choose the pictures you put in your head and focus on. Step 2: Change your tonality. The way you speak to yourself. If you speak to yourself in a angry tone, then you’ll feel angry. If you speak to yourself in a victim tone, they you’ll feel defeated and sorry for yourself. And if you want to feel happy, then simply shift your voice…speak to yourself positively by changing the tonality of your voice. Step 3: Change your physiology. Shift your physiology by adjusting your posture, movement, and breathing. How you hold yourself together will greatly affect your state of being. It can either disempower you or energize you. For example, right now…sit up straight, relax your body, roll back your shoulders and open your chest, and hold your head high. How do you feel? Can you feel your emotional state change simply just by adjusting your physiology? Becoming aware that both our negative and positive emotion originates from our pictures, our tonality, and our physiology is the start to changing our feeling. By changing these, you can shift your outcome… Eliminating the negative emotions that no longer serve you and start creating positive ones that better serve you in your journey forward. Once you can start to control your emotions…And become in charge again and no longer a victim to it. You’ll be able to move throughout the range of emotion and have choice and flexibility to select the emotion you wish to feel as you increase your emotional intelligence. No longer will you be stuck in a chronic state. Emotion is a choice. You are now free at last to make your choice! 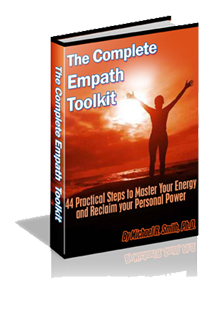 This entry was posted in -Daily Care Tips For Empaths, -Empath Solutions & Tools and tagged control feelings, control negative emotions, control of emotions, controlling emotions, eben pagan, how to change emotions, how to control emotions, how to control your emotions, negative emotion, negative emotions, positive emotions, thinking positive thoughts, wyatt woodsmall on July 23, 2012 by EmpathSolutions.